The Floor-standing Giants review ! «This is a very big loudspeaker»… was my first comment when I saw the Figaro XL from Lithuanian based manufacturer Audio Solutions. Of course, with such dimensions (1748mm x 356mm x 618mm (HWD)), this loudspeaker, including its feet is taller than me, while when viewed from the side is almost as massive as my refrigerator! While I was circling around Figaro XL, so that I “digest” all of its sides and imposing size, like a child that was given by its parents the best gift of all, I slowly started to notice these minute details that are very important to the final audio result. Like, for example, the speaker’s binding posts (original WBT NexTGen) since the company specifically mentions not only the importance of the high quality construction of those but also the importance of a high quality electrical connection at that point as a prerequisite for high-end sound (the decision of Audio Solutions to choose high quality parts in all steps of constructing the Figaro line of speakers –more about that later on- shows their commitment to built something that performs way better than what we consider to be “normal” in the specific price category). And that is not the only thing I observed. The drivers that the company uses in its lineup come from SB Acoustics, a company that combines top European engineers with many years of experience in a European company with top credentials with the normal cost but still very high quality built that results from an Indonesian based, production company, since only there they were able to find the proper combination of high quality, reliability and low cost. and front cup (some kind of a mini horn loading) that gives the sound top levels of detail and dynamics with a smooth and natural character. So, I was looking around the speakers and the next words coming out of my mouth were “so how much do the weigh?” with the answer being “around 105 kilograms each”, which sounded a little less than what I was expecting, for the size of the speakers but also for the amount of drivers that each contains (seven in total, four 8 inch woofers, two 6 inch midranges and 1 tweeter). And yet because of a revolutionary build method, Audio Solutions has managed to make this new line of speaker boxes with exemplary stiffness and substantially effective vibration control (secondary vibrations, aka colorations) which would be around 50-70% heavier if they were made with the traditional way while keeping the stiffness at the same high levels. This method is called Self-Locking construction and it offers that same level of stiffness as a monolithic design . This method, besides the lower box colorations, helps so that the resulting cabinets are also much lighter . It’s like in Audio Solutions decided that they will upset everything we know about speaker construction methods and pricing. And yet, they did not stop there. To keep the costs low without any losses at the“looks” department they chose to keep things simple but elegant and yes, they do not offer full wood veneer coverage of their speakers in the Figaro lineup, but they do offer such a variety of colors (targeting mostly the younger generation) that honestly I cannot see generating any righteous complaints, even from the worst conservative users, about their looks. Now, if we also take into account the two front cover choices they offer (one with cloth and one with specially geometry designed “naked driver” approach) that both leave the drivers to work without any disturbances (the “naked” more than the clothed one), I am sure that everybody will be happy from their looks. 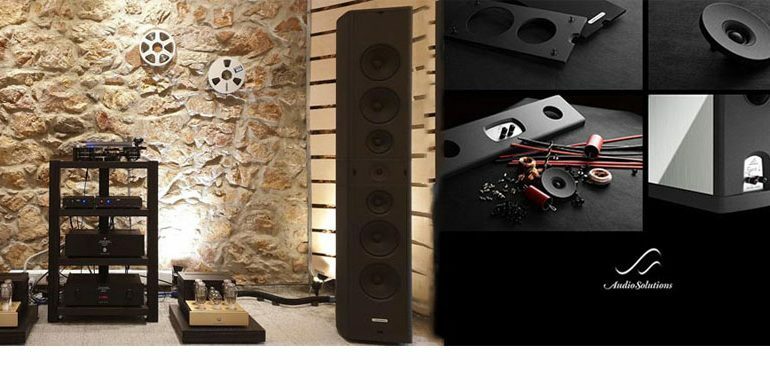 But a loudspeaker is not only quality drivers, top stiffness cabinets and high-end binding posts, the crossover circuit is a major factor on its final sound. Here again Audio Solutions have gone one step further since not only the use quality parts (baked air coils, film capacitors of very low tolerances, point to point cross) that other more “sic” manufacturers put in much costlier models, but it combines these parts in a way that result in very low colorations (from secondary vibration microphony), seamless driver synergy and very low electrical distortions. 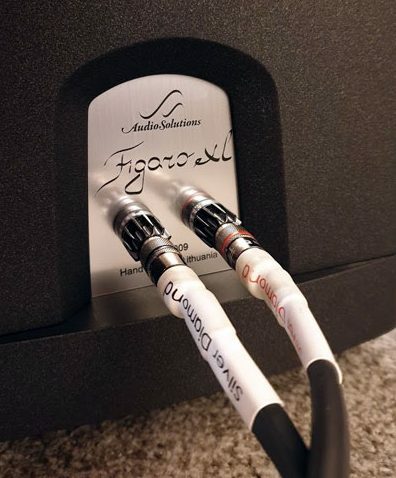 Audio Solutions mentions that in the Figaro line they use special boards with very heavy traces in a way that results in very tight spec matching without lengthy tweaking. 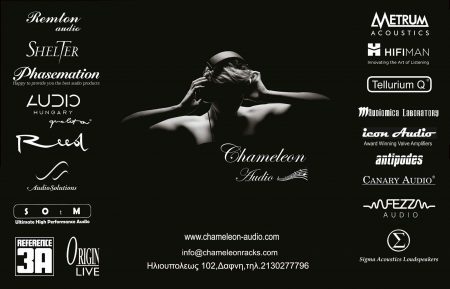 Chameleon Audio Greece Auditioning Room: Canary Audio USA, Audio Solutions Figaro XL speakers, Origin Live Turntable, TelluriumQ Cables, Metrum Acoustics DACs. 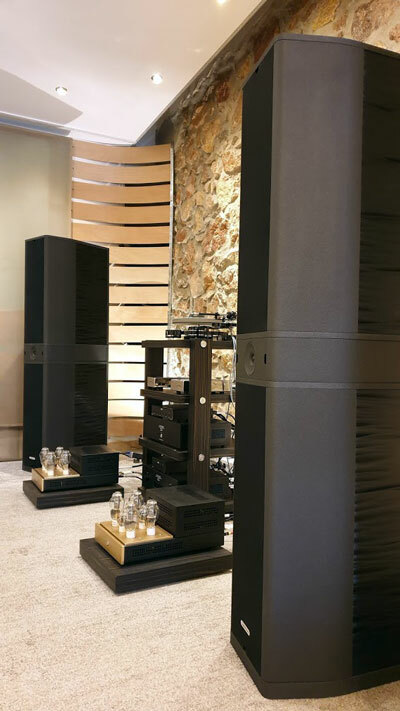 As you can guess, size and weight limitations prevented me to move these speakers in my listening room, which by the way it cannot sustain such big speakers because of its limited size (25 sq meters). 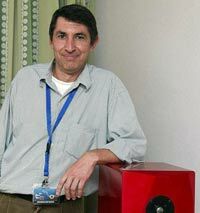 I am sure that the future owners of such big speakers will put them in the bigger rooms they deserve (and demand). Besides that limiting factor everything else went as planned. What does that mean? Well, let’s start with the review system (at the local distributor room). As the source I used the pair from Metrum Acoustics Onyx I2S & Ambre (Roon end point) with music files I brought with me in a USB stick. The preamplifier was the pretty good Canary Audio C800MkII (two chassis) and the power amps were the monoblock pair, again from Canary Audio, M350 (Class A 50W) that use four 300Β per channel, while for further evaluation I used also some Hungary Audio amplification plus a Class-D (Texas Instruments based) power amplifier. That way I had the chance to successfully ascertain the degree of transparency and revelation of each amplifier character from the speakers. Power cables were the Tellurium Q Silver Power / Tellurium Q Black Power, interconnects the Tellurium Q Silver Diamond / Black Diamond, speaker cables the Tellurium Q Silver Diamond, and for the I2S transmission I used the Tellurium Q Silver Diamond. Of course the rack was one of the many Chameleon Audio designs and makes. This time I did not use any AC filtering, but I am sure with the use of such devices the level of reproduction would raise even higher. Listening distance was around 4 meters from the speakers as in that point, and in that dealer’s room the resulting low frequency response was proper as far as extension, control and speed were concerned, while keeping the naturalness of the mid frequencies as correct as possible. And yes, the sound from all these drivers was seamlessly combined even at close distances of 1.5 meters, I checked that too. So, the Figaro XL is a very, very good speaker that pretty much destroys the competition in the 10,000 euro price category as far as sound quantity and quality is concerned. Specifically, the speaker is capable to reproduce almost the entire frequency range with very low distortion and deliver a very high quality sound result . Small groups, solo voices and instruments, big orchestras are being reproduced without any perceivable compression (if the amp can provide of course the necessary dynamic power, even though in the case of the XL with its 92dB/W/m sensitivity and 8 Ohm nominal impedance the load does not present a big hurdle). the dealers listening room, which by the way is at least 50% bigger than mine, things got a bit overwhelmed when I tried to go a overboard in the sound pressure department (which of course was not a speaker problem per se, so if you have a room that is of the medium to small size try the other smaller speakers of the Figaro line, they deserve your attention) which resulted in lower satisfaction listening points in this case. But still the result was a lot of fun! 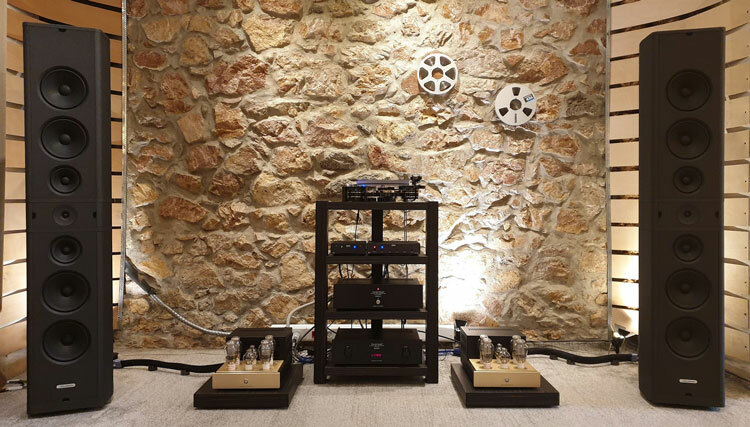 Tonal balance of the XL was almost flawless, direct result of the drive unit quality, the “stealth” front covers, the rigidity of the cabinet and seamless drive unit combination. The ability of the speaker to differentiate and set up the harmonic envelope of each instrument in space is very high and that will be a plus point with many demanding audiophiles. The speakers possess a harmonic versatility that we usually find in as expensive or more but smaller in size loudspeakers that by the way have trouble reproducing the dynamics and power of live music like the XL. different amplifier I tried, made clear that the XL will be a valuable tool for the demanding listener so that he/she can tune their system to their individual tastes. So, yes, this speaker is transparent despite its size (and yes, I am familiar with other speakers of that size that are as much or more transparent but they cost multiple amounts of money). The ability of the Figaro XL speakers to define the dynamic range of each recording is another very strong point you should appreciate (which by the way should be capable of because of its size and driver combination, but in this life “should” and “would” most of the time do not go together). 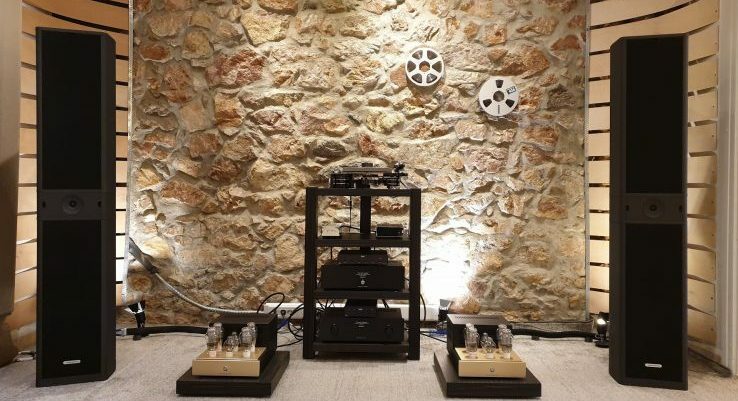 Now, depending on the amplifier connected to it the speaker either was ruthlessly dynamic or very gentle, either more “earthly” or “ethereal”, more “pistonic” or “feather like”… It is so transparent, cool and sufficiently uncolored that dealing with it was such a delight! Last but not least, the Figaro XL excelled also in the department of stereo imaging, which is something difficult enough to achieve with such a large loudspeaker. Size is, usually, a limiting factor in this department (especially with basic “boxy” constructions), but this time shape and size doesn’t seem to be an object in the creation of real life presentations in front of the listener. That is my friends the result of careful crossover design, cabinet geometry and special attention that was give at the shape of the front driver covers. The effort of the Lithuanian based company of Audio Solutions has definitely made the competition’s life way more difficult. 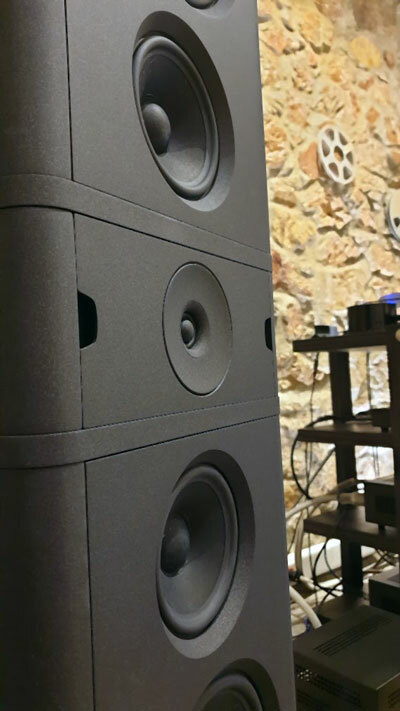 The built quality, everything that hides inside a loudspeaker but has major impact on the final sound result has, in the case of the XL, reached almost their limit and, believe me, it sounds like it. This is a game-changer (for the category it belongs) loudspeaker, a speaker that is extremely competitive even when directly compared to much more expensive designs, that will give you back whatever you “feed” it. So it is only natural that I give it my highest recommendation if you are looking for a speaker in that price level or even higher, since is a very effective and valuable solution for pretty much every taste, an almost perfect solution for most of us. How many times have you encountered something like that? Floor-standing loudspeaker, 3-way, with 1x dome tweeter, 2x midrange 6”, 4x woofer 8”.